When it comes to shopping for walking boots, Hanwag may not be a brand name with which you are over-familiar but, if you are in the market for a rugged and reliable pair of hiking boots, they have been making mountain boots for 90 years and are definitely worth a look. 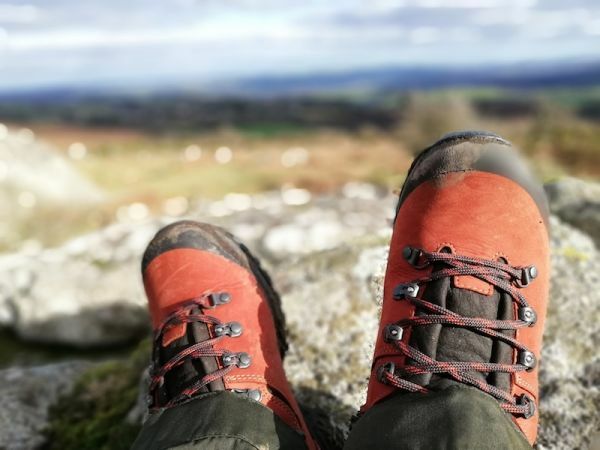 A pair of Hanwag boots can set you back a fair bit (depending on your level of desire for handmade perfection), which means that they are maybe not the best boot for someone who is just setting out on their walking career. If, however, you have been struck by the walking bug and are planning to walk in all kinds of terrain, right through the year, Hanwag are definitely worth considering. Do you like orange? I do and am particularly pleased announce that the Hanwag Tatra II GTX walking boot comes in five different and rather attractive colours. The aesthetics of a hiking boot are, of course, important (well they are to me) but definitely not as important as longevity, sturdiness over rough terrain and waterproofing. I am pleased (because I like their colour so much) to announce that my new Hanwag boots tick all of the above boxes (I am making a professional prediction about their longevity as they are clearly very well made). 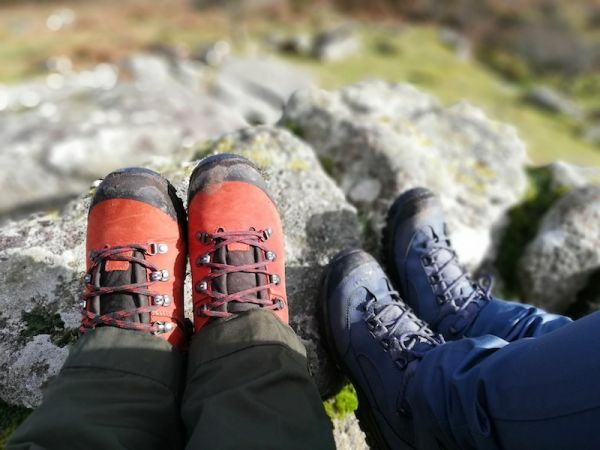 We Blondes like to test our boots well and have an uncanny knack of finding most types of terrain in areas of Dartmoor that other people could probably walk in their slippers. Not far from Haytor (please don’t really go there in your slippers) we took our new boots through up-the-ankle-deep streams, across slippery brown mud, up steep inclines and over rocky ground. A good workout, I am sure you will agree. Because of a previous ankle injury I prefer boots that offer a good level of stiffness and support and it can be tricky to achieve this, particularly in a brand new boot, without excessive rubbing or achilles issues. The Tatra Lady II is cut well around the back of the ankle and hugs it well on side-sloping ground. It also grips well over rock and kept my feet bone dry in the mud and streams. 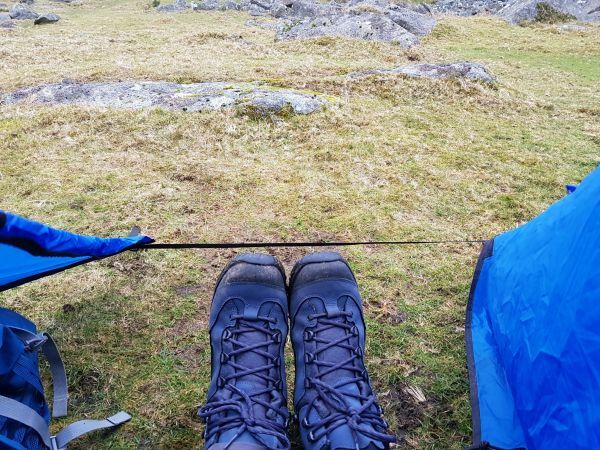 I also tested them with a full camping rucksack as this can put additional strain on unwary ankles and they performed very well. They are perhaps a bit narrow in the foot for me but most Hanwag boots come in different width fittings and I would recommend trying the wide fit if you think you might need it. What do I like about my new Hanwag Banks II boots? Well, there are many things but the main thing that attracted me to them was the colour! They match my new favourite trousers, they match my sleeping bag (although I don’t think I’ll wear them in my sleeping bag) and as you can see from the photo, they match my favourite wild camping tent. What’s not to love about a good dose of colour co-ordinating? Apart from the colour these Hanwag boots have lots to recommend them. They come in a wide fitting which is great and allows plenty of room for two pairs of socks without feeling squashed. I like my boots to be a bit loose on my feet with plenty of wriggle-room; these are perfect. So far they have come on several adventures: short and long, overnight and just daytime, rough terrain and easy paths, a bit wet and very wet. They have performed excellently throughout. If I was to be ultra picky (it sometimes happens, you know) then I would have to say the laces could be a bit longer. If you want to use all of the excellent lacing hooks and still have wriggle room then the laces are too short to do in a double knot. Minor details for a boot that is set to keep my feet very happy for quite some time to come.